Leading Manufacturer of steel bar straightening cutting machine and rebar decoiling machine from Ghaziabad. To meet the diversified requirements of our prestigious clients, we are involved in offering a qualitative array of Steel Bar Straightening Cutting Machine. The machines offered by us adopt a technology reasonable structure with small operating that is noise free and easy to maintain. For their fabrication process, we make use of the finest grade raw material and advanced techniques. In addition to this, our complete product range is examined on certain parameters to ensure that it stands high in terms of functionality, efficiency, sturdiness and quality. The function of straightening and cutting is stable and safe. Low vibration and voice, convenient adjusting. The Bar will be smoothly after straightening, high efficient. Rebar decoiler machine is mainly use for rebar straightening and Cutting. this machine also known as cnc decoiling and cutting machine. Most effective, reliable and low maintenance. 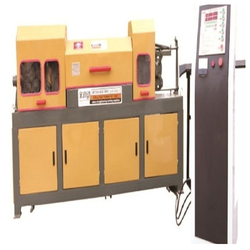 I. S. ENGINEERING WORKS is the Industrial supplier of rebar decoiling machine. We have advanced and high quality machine which is required as per customer need. 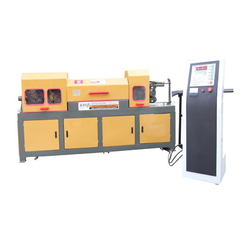 Ø The function of straightening and cutting is stable and safe. Ø Low vibration and voice, convenient adjusting. Ø The Bar will be smoothly after straightening, high efficient.